I recently went to chat with Governors Harbour resident Bill Burrows to hear his memories of the Potlatch Club in Eleuthera. Bill was born and bred in Governors Harbour and he worked at the Potlatch Club from 1961 until 1971….. Potlatch for those of you who don’t know was on the Banks Road – just before Tippy’s restaurant and Pineapple Fields – you can see some of the old run down buildings still – just about standing. Both Tippy’s and Pineapple Fields are on the parcel of land that once was the Potlatch acreage. It was a hotel / club that grew in an amusing organic way – more of which later. There had been a private house on the 60 acre site since the late 1940’s but in 1958 Elizabeth Taylor from the East Coast of the US visited Eleuthera to play golf and was captivated. She immediately contacted a friend of hers – Mrs Diane Adams and told her she needed to get down here ! Diane Adams, Marie Drakes and Elizabeth Fitzgerald then set up the Potlatch Club. Local contractors James Gaitor and Richard Rolle did most of the building work. Potlatch is a term derived from a North West American Indian ceremonial feast – where possessions are destroyed or given away to display wealth or enhance prestige ! Bill quickly learned to wait at table as well as becoming head barmen. He rapidly read up on how to make some of the more exotic cocktails they demanded and offered a great service to all the guests there. He became very well loved and was tipped generously. He fondly remembers Sir Harold Christie from Nassau who used to tip him one English pound during the sixties – worth the equivalent of around $50 now ! As an aside Sir Harold Christie from Nassau owned the house that we live in – Buena Vista – it was his vacation home ! More information from the brochure ! Bill worked with the late Charles Sands and the pair of them used to enjoy serving early breakfasts on trays to guests who wanted an early start to go bone fishing – the kitchen didn’t start serving breakfast until 8am. Lunch was a buffet served around the pool and dinner a much more formal affair served in the restaurant. Guests would often arrive for dinner from Cotton Bay south of Rock Sound. French Leave was also open at this time and and the 2 places co-existed and were on very friendly terms. Potlatch Club was perceived as an exclusive and sophisticated resort and according to Bill paid the best wages ! The club began to suffer financially given their un- business like approach so the ladies came up with a great scheme to raise much needed money. They sold off building plots to guests who would then have their own houses built which would be their home but also would provide accommodation for more hotel guests – a way of bringing in much needed capital but also in effect growing their business. These houses are still here on the land that used to belong to Potlatch. 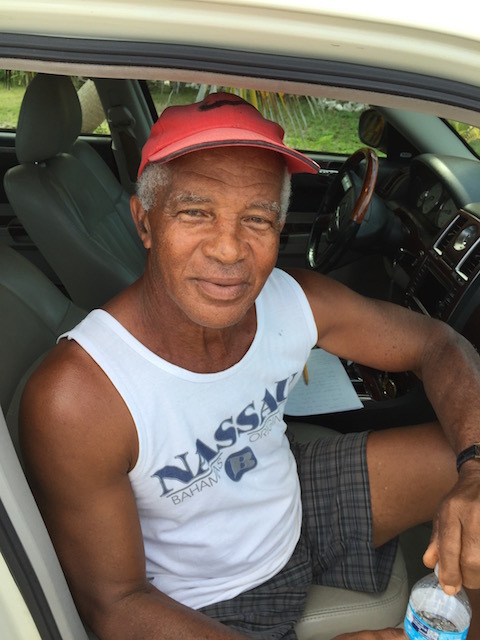 The architect Ray Nathaniels – living in Nassau at the time was a popular choice for designing several homes here in Eleuthera as well as having been involved in the design of the main building at Potlatch. Sadly in 1971 Bill was warned by the hotel’s accountant that the business was about to fail – and he suggested that Bill look around for alternative work. The place did founder and fail in the early seventies but was bought in 1979 by Robert Joiner but it never was open again as a hotel. Ros, his daughter , told me they would often be sitting around the pool and people would turn up and ask to see a lunch menu -only to be told that it was no longer a hotel ! After Bill left the Potlatch Club in 1971 he began a long career as a very good painter and decorator – but that is for another blog ! Many thanks to Ros Seyfert from Haynes Library for the Potlatch Club brochure. What a treasure trove she has ! Thanks so much for sharing this. I love history lessons retold from a human interest, more vibrant perspective! And love The Haynes Library, a treasure trove. So pleased you enjoy the blog – welcome back home and hope to bump into you again while you are here…..
How about some photos of the place. Who owns it now? Can we access the beach from the property or is it unavailable. I’m headed down for my three week fall visit. Looking forward to exploring, if possible!! Some of the original property is occupied – watch this space for future news of it all …… I am not sure if you can see any of it from the beach – but as I say people are living in parts of it. Are you Lynn Larson from Southampton? Oh Kathy! What a swell job of researching and rendering Eleutheran history. I do hope you print out in paper your blog pages. Historically, paper seems preserved far longer than other means of conveyance. You are providing a good reference source. the other day about his time at Potlatch – it is so interesting for us to find all these stories out and begin to build a picture of how things were back then. So thrilled that you saw the blog and commented on it – thank you ! Bill Burrows looks well – I’m looking forward to seeing him again soon. And the Potlatch post is excellent, thanks Kathy. He was absolutely glowing when he was talking about those days…. So lovely to see ! How odd to have stumbled upon this blog. As a child, I stayed at the Potlatch Club with my mother as a guest of Peep Fitzgerald who had at one time been my piano teacher. Haven’t thought about the place in decades. May be time to revisit but am afraid that old adage “you can’t go back” would prove to be all too true. So pleased that you found it ! Eleuthera is still a very beautiful island and of course we absolutely love the Governors Harbour area….. Maybe if you visit it will remind you of happy memories – the beaches are still largely deserted – there are just so many stretches of beach that you hardly see anyone….. Thank you for making contact…. My grandfather, Allen Sawer used to manage the Potlatch Club in Eleuthera. My favorite childhood memories are when my parents (Stephen & Sandy Sawer) where the Tennis pros at the Windermere Island Club and growing up in Eleuthera. Hope to move back one day! I remember Allen Sawer!!! And, I knew your parents at the Windermere Island Club! My husband and I stayed at Potlatch many times and even spent a Christmas in two of the houses after Joiner resided there. Then we joined the Windermere Island Club. We stayed at suite #90 and Cherokee for Christmases. Memories that will last forever! My husband passed away and not a day goes by that I don’t think of Eleuthera. I would live there if I knew someone now. I found this article on Eleuthera from a very old newspaper. Not sure how to post photos on this site of my grandparents Allen and Eileen Sawer when they managed it? I just traveled back to Eleuthera with my parents in February 2017 to get married and my dad was so happy to go back and spread their ashes on the island they once loved so much. Thanks so much for this…. Just trying to figure out how to view the whole article at the moment…. It is always so lovely when someone pops up with something like this. And I love that your dad brought them back here…. Congratulations on your marriage and I hope that you come back again…..
OMG, even my niece Avalon knows about this site?!! I just stumbled upon it looking for info about Potlatch and Windermere, trying desperately to recapture my gloriously misspent but now lost forever youth! Hahaha! When I headed out to Canada to start a different life, my parents Allen and Eileen Sawer told me that I would miss Eleuthera and The Bahamas and I snickered but guess what? They were even right about that, all these years later! At the outset, I want to thank Bob and Kathy Colman for researching my long lost youth at Potlatch Club. I remember Bill Burrows well and appreciate his often charitable recollections. To explain my arrival on this scene, I have to make one correction. Betty Taylor, Diana Adams, Elizabeth Fitzgerald and others were all initial explorers and investors… however, my mother Marie Driggs (not Marie Drakes) joined with Diana Adams and Liz Fitzgerald as initial investors. Two years ago my family surprised me with a return trip to Eleuthera for my 70th birthday I hope to return (Pineapple Fields) for my 40th anniversary in 2017. My own recollections of life at Potlatch could fill volumes. But the most appreciated comments come the families of the many wonderful people that did such a superb job of looking after Potlatch visitors and guests. On behalf of all the founders, I would like to offer a sincere thank you for past deeds and kind remembrances. I hope to see the remaining Potlatch family, their children and grandchildren on my return next year. How lovely to hear all this ….It is so important that the corrections are made while there are still people around with clear memories! Do please let us know when you return next year – it would be lovely to meet you…. I met your Mother, Diana and Liz in the late 1980’s and she was a delight and a very good hostess! I was visiting with Mary Henderson, my then Mother-in-law, who used to run the club some years before. I was married to her son, Alex. Mary treated us to a trip along with her Daughter, Mary Clair and her family as they spent so much of their youth on the Island. It is Alex’s birthday on 23 rd and I will be seeing all the family, despite being divorced years ago. They will be thrilled to hear from you so I will pass on details of this web site. I did go in search of the old club with my son, Edward, a few years ago when we were staying on Windermere. We searched through the undergrowth and had a good look at all the buildings . the kitchen looked like it had been left in the middle of cooking a meal! Great news that it has been bought and is being lovingly restored. I think I may plan another visit soon. How lovely that this blog is now linking people up after a good few years ! I will post some more up to date pictures very soon. the restoration and renovation is coming along brilliantly ! I have very fond memories of the Potlatch Club when, as a child, I visited with my family. Not mentioned in any of the info shared above is the name of the world-class (and personally high-class) chef Peter von Starck, who went on to create the restaurant that really sparked the restaurant renaissance of Philadelphia: La Panetiere. Excellent job Mrs. Colman. Love the blog. So pleased you like it ! Thanks…..
Bob and Kathy Colman, I would like to add my thanks to you for making the time to chronicle some of the patchwork history of Potlatch Club. As mentioned, my mother, Marie Driggs was one of the three founders and it’s very interesting and gratifying to read some of the fond memories. It is also surprising to me how accurate most of recollections really are… including some that I had forgotten after spending nearly 15 years with Eleuthera in my blood. I have been providing the new Potlatch owners with some back ground stories and trying to convert some old pictures to to be media friendly. * As mentioned, Mr Bill Burrows recollections are amazingly accurate with the exception of my mother’s name, Marie Driggs. I remember Bill as a very kind, loyal and generous man who was a very important part of the warm welcome Potlatch tried to provide. * I enjoyed Susan Holt-Harris’ post about Elizabeth “Peep” Fitzgerald. She was indeed a world class pianist, made all the more impressive given that she was partially paralyzed as a youth. Peep often played for the guests when she had the strength to maneuver around the keyboard. * I enjoyed Avalon Sawer’s comment about his grandfather, Allen Sawer. I remember Allen as a caring, giving, down to earth guy who was a refreshing change from the often overwhelming guest roster. * Peter Von Stark was more than an excellent world class chef, for a good many years he was the main draw for Potlatch guests. The ambiance and physical location helped but Peter had a master touch as head chef. Peter also prepared food during the “off season” at other places the “Triumvirate” owned in Saratoga New York and Mallorca, Spain..
As I believe Haynes library has on record, the 3 owners also had a small restaurant in Gregory Town called the “Talking Dolphin” which welcomed all but was enjoyed by Potlatch guests during day trips . They had stand alone ovens and I still remember the scent of fresh baked bread. Sorry , to drown you with ancient history but it is your fault! … you have brought back many wonderful memories. I don’t know how to post them but I have numerous pictures of myself as a little blonde boy devouring coconut cream pie at the Talking Dolphin in Gregory Town, it was my favorite dessert to order there! My father, Allen Sawer, used to drive me through Hatchet Bay, past Sweeting’s Pond and into Gregory Town and we always ended up there. Other fond memories are riding my little tricycle all over Potlatch, hanging out with the staff at the laundry and garden nursery and visiting a local family named Nixon who some distance away, just off of Banks Road. I also remember meeting Broadway star Mary Martin and Maria Shriver at Potlatch Club in the sixties! Such great stories – maybe you could email the pictures to me ? kathy@kathycolman.com I would love to post them ! Thanks for the wonderful memories! My father Allen Sawer ran the Potlatch Club during the sixties and I lived there with him, my mother Eileen and brother Steve. We survived the devastation wrought by hurricane Betsy in 1965 by seeking refuge in the art gallery which had a bedroom and was solid and stable. We also knew Billy very well, such a happy and delightful person and also those ladies who you mentioned. My father left in 1968 to manage the Windermere Island Club, some distance away. I cherish my memories of the sixties, like The Beatles, Potlatch/Windermere and movies at Arthur Rolle’s theatre in Governors Harbour! Great to hear this !